The fern genus Dryopteris (Dryopteridaceae) is among the most common and species rich fern genera in temperate forests in the northern hemisphere containing 225–300 species worldwide. The circumscription of Dryopteris has been controversial and various related genera have, over the time, been included in and excluded from Dryopteris. The infrageneric phylogeny has largely remained unclear, and the placement of the majority of the supraspecific taxa of Dryopteris has never been tested using molecular data. In this study, DNA sequences of four plastid loci (rbcL gene, rps4-trnS spacer, trnL intron, trnL-F spacer) were used to reconstruct the phylogeny of Dryopteris. A total of 122 accessions are sampled in our analysis and they represent 100 species of the expanded Dryopteris including Acrophorus, Acrorumohra, Diacalpe, Dryopsis, Nothoperanema, and Peranema. All four subgenera and 19 sections currently recognized in Dryopteris s.s. are included. One species each of Arachniodes, Leptorumohra, and Lithostegia of Dryopteridaceae are used as outgroups. Our study confirms the paraphyly of Dryopteris and provides the first strong molecular evidence on the monophyly of Acrophorus, Diacalpe, Dryopsis, Nothoperanema, and Peranema. However, all these monophyletic groups together with the paraphyletic Acrorumohra are suggested to be merged into Dryopteris based on both molecular and morphological evidence. Our analysis identified 13 well-supported monophyletic groups. 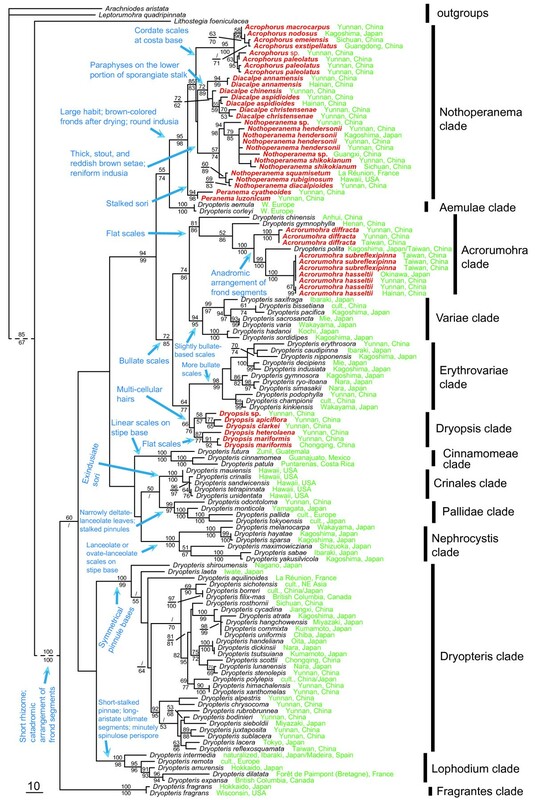 Each of the 13 clades is additionally supported by morphological synapomophies and is inferred to represent a major evolutionary lineage in Dryopteris. In contrast, monophyly of the four subgenera and 15 out of 19 sections currently recognized in Dryopteris s.s is not supported by plastid data. The genera, Acrophorus, Acrorumohra, Diacalpe, Dryopsis, Nothoperanema, and Peranema, should all be merged into Dryopteris. Most species of these genera share a short rhizome and catadromic arrangement of frond segments, unlike the sister genus of Dryopteris s.l., Arachniodes, which has anadromic arrangement of frond segments. The non-monophyly of the 19 out of the 21 supraspecific taxa (sections, subgenera) in Dryopteris strongly suggests that the current taxonomy of this genus is in need of revision. The disagreement between the previous taxonomy and molecular results in Dryopteris may be due partly to interspecific hybridization and polyplodization. More morphological studies and molecular data, especially from the nuclear genome, are needed to thoroughly elucidate the evolutionary history of Dryopteris. The 13 well-supported clades identified based on our data represent 13 major evolutionary lineages in Dryopteris that are also supported by morphological synapomophies. The fern genus Dryopteris Adans. (Dryopteridaceae) is estimated to contain 225 to 300 species worldwide [1, 2]. The circumscription of Dryopteris has been controversial and various related genera have been included in and excluded from Dryopteris (see ). Christensen  divided Dryopteris into seven subgenera, six of which belong to today’s Thelypteridaceae. Van Alderwerelt van Rosenburgh  separated Stenolepia Alderw. from Malaysian Dryopteris. Christensen  also split Stigmatopteris C. Chr. from American Dryopteris. Later he  gave up his earlier treatment and recognized Dryopteris sect. Stigmatopteris (C. Chr.) C. Chr. Ching  separated Lithostegia Ching from Sino-Himalayan Dryopteris. Later, Lastreopsis Ching  and Ctenitis (C. Chr.) C. Chr. were both separated from Dryopteris. Nothoperanema (Tagawa) Ching was established by Ching  based on Dryopteris subgen. Nothoperanema Tagawa . Thinking “Ctenitis subgen. Dryopsis Ching” (nom. inval. ; Art. 36.1, ) to be more closely related with Dryopteris, Holttum & Edwards  described Dryopsis Holttum & P. J. Edwards as a genus. The phylogenetic positions of most of these genera have recently been clarified. Stigmatopteris and Ctenitis are both rather isolated within the dryopteroid lineage , while Megalastrum Holttum, a relatively recent segregate of Ctenitis, forms a clade with Rumohra Raddi and the paraphyletic genus Lastreopsis[14, 15]. None of these genera are in fact closely related to Dryopteris. Although the close affinity among some but not all of Acrophorus C. Presl, Acrorumohra (H. Itô) H. Itô, Diacalpe Blume, Dryopsis Dryopteris Nothoperanema, and Peranema D. Don has long been noticed (e.g., [16, 17]), it has been unclear exactly how they are phylogenetically related. In studying the historical biogeography of the species of Hawaiian Dryopteris, Geiger & Ranker  sampled 63 species of Dryopteris and found Nothoperanema (represented by one species) to be embedded within a paraphyletic Dryopteris. Using rps4-trnS sequence data of 60 Chinese species of Dryopteris and several related genera, Li & Lu  reinforced Geiger & Ranker’s  finding that Nothoperanema (three species sampled) should belong to Dryopteris and for the first time confirmed that Acrorumohra (one species sampled) belongs to Dryopteris as well. The inclusion of Acrophorus Diacalpe Dryopsis, and Peranema in Dryopteridaceae was strongly supported by Li & Lu’s  and Liu et al.’s  works based on rbcL and rbcL + atpB data, respectively. With relatively small sampling, both of the works also found that Dryopteris is paraphyletic in relation to these genera plus Acrorumohra. To date, Fraser-Jenkins  has carried out the most intensive taxonomic study on Dryopteris worldwide, partly on the basis of early such work carried out by Itô [22, 23] on the Japanese species and by Ching  on species in China, the Himalaya, and neighboring areas. Fraser-Jenkins  recognized 225 species which he divided into four subgenera: D. subgen. Dryopteris D. subgen. Erythrovariae (H. Itô) Fraser-Jenk., D. subgen. Nephrocystis (H. Itô) Fraser-Jenk., and D. subgen. Pycnopteris (T. Moore) Ching. He divided the former three subgenera further into 16 sections. In his series of studies of species of Dryopteris in Yunnan, China, Lu [2, 24, 25] proposed three new sections: D. sect. Caespitosae S. G. Lu, D. sect. Chrysocomae S. G. Lu, and D. sect. Indusiatae S. G. Lu, two of which were adopted by Wu & Lu  in their classification of the 127 Chinese species of Dryopteris. The non-monophyly of D. subgen. Dryopteris and D. subgen. Pycnopteris has been detected by Geiger and Ranker  and Li and Lu [19, 20], respectively, using DNA sequences of one or two loci and with relatively small species-level sampling (ca. 60 species in both studies). Based on analyses of seven plastid loci and 97 Dryopteris species, Sessa et al. rejected monophyly of eleven of Fraser-Jenkins’  sections and three of the four subgenera. Several additional sections have never been tested for their monophyly using molecular data. The goals of this study include:  vigorously testing the monophyly of Dryopteris by including representative species of every subgenus and every section of Dryopteris currently recognized and by including all controversially related genera;  resolving phylogenetic relationships between Dryopteris and Acrophorus, Acrorumohra, Diacalpe, Dryopsis, Dryopteris, Nothoperanema, and Peranema;  assessing the monophylies of supraspecific taxa at sectional and subgeneric ranks recognized in current classifications using relatively large sampling and DNA sequences of multiple loci; and  identifying major evolutionary lineages in Dryopteris. The characteristics and statistics of four individual plastid regions from MP and ML analyses are presented in Table 1. The four individual plastid regions as well as the combined trnL intron and trnL-F spacer yielded similar tree topologies in both MP and ML analyses (trees not shown). The most parsimonious, parsimony JK, and likelihood JK and BS trees for all analyses are available upon request from the first author. There were no well-supported (≥70% JK or BS support; ) clades that conflicted with one another in both the parsimony JK and likelihood BS trees. Therefore, the four plastid regions were combined. “PI” = parsimony-informative. “% miss. / inappl.” = percentage of cells in the data matrix scored as missing or inapplicable. “MPT” = most parsimonious tree(s). “MP” = maximum parsimony. “ML” = maximum likelihood. “JK” = jackknife. “BS” = bootstrap. “CI” = consistency index. “RI” = retention index. The combined data matrix of four plastid regions consisted of 3,638 bases. A simultaneous analysis [29, 30] of nucleotides from all plastid regions was conducted as the primary basis for phylogenetic inference in Dryopteris. Unweighted MP simultaneous analysis generated 1,785,800 most parsimonious trees with a length of 1,831 steps, a consistency index (CI; ) of 0.5877, and a retention index (RI; ) of 0.8370. The MP simultaneous analysis terminated prematurely when it was out of memory. The ML simultaneous analysis generated one optimal tree which is shown in Figure 1. The tree topology of the MP simultaneous analysis was similar to that from the ML simultaneous analysis and there existed no well-supported conflicts between the two trees. Simultaneous-analysis maximum likelihood tree with parsimony jackknife values above each branch, and maximum likelihood bootstrap values below each branch. If a clade was resolved in one analysis but not the other, “/” is used to indicate which analysis that clade was not resolved in. Dashed branches indicate the disproportional branch lengths. The species in red color indicate those that are currently not in the genus Dryopteris but resolved as members of Dryopteris in this study. Major morphological and/or palynological synapomorphies are indicated in blue. Geographical provenances are indicated in green. Our analyses showed that Dryopteris in its current circumscription is paraphyletic in relation to Acrophorus Acrorumohra Diacalpe Dryopsis Nothoperanema, and Peranema (Figure 1). This resolution is consistent with that of Geiger & Ranker , in which only Dryopteris and one species of Nothoperanema were sampled. Our finding is also in accordance with that of Li & Lu  who sampled Acrorumohra Dryopteris, and Nothoperanema. Sessa et al. found Dryopteris to be monophyletic, but did not include representatives of any of these six genera in their sampling schemes. Our study provides the first strong molecular evidence that the traditionally defined Peranemataceae sensu Wu [33, 34] and Wu & Ching  (Acrophorus Diacalpe, and Peranema), and Acrorumohra Dryopsis, and Nothoperanema, should all be merged into Dryopteris, though each is monophyletic except Acrorumohra. The expanded Dryopteris is supported as monophyletic with strong support (Figure 1; ML BS: 100%; MP JK: 100%). Interestingly, except for Acrorumohra and Nothoperanema, and despite the similarity among members of these genera, the study of Li & Lu  was the first to suggest that Dryopteris was paraphyletic with respect to Acrorumohra, Acrophorus, Diacalpe, Dryopsis (included in Ctenitis), and Peranamea. Such a close relationship among all of them had not previously been suggested in the literature, although the close affinities among Peranemataceae, Dryopsis (previously in Tectariaceae), and Dryopteridaceae have partially long been noticed (e.g., [8, 13, 16, 17, 33]). Morphologically, Peranemataceae, Dryopsis Dryopteris, and Nothoperanema share short rhizome and catadromic arrangement of frond segments. The family Peranemataceae was established by Ching ; as “Perenemaceae”] and is composed of Acrophorus Diacalpe, and Peranema[33–35, 37, 38]. Kramer  recognized Acrophorus Nothoperanema Peranema (including Diacalpe), and Dryopsis as independent genera, in addition to Dryopteris and another 24 or 25 genera (with one being Incertae Sedis), in his large subfamily Dryopteridoideae, one of the two subfamilies in Dryopteridaceae sensu lato (the other one is Athyrioideae). Recognition of these genera in Dryopteridaceae was largely followed by Smith et al.’s  classification. It is clear now that Dryopteridaceae sensu Kramer  are highly polyphyletic and contain the now separately circumscribed families Athyriaceae, Cystopteridaceae, Dryopteridaceae, Hemidictyaceae, Hypodematiaceae, Oncleaceae, Tectariaceae, and Woodsiaceae (e.g., [39, 40]). Morphologically, Peranemataceae can easily be distinguished from Dryopteridaceae by having slightly raised receptacles and inferior indusia that are coriaceous and globose or membranaceous and semi-globose [33–36]. However, the two families have the same basic chromosome number, x = 41. Morphologically, they also share catadromic arrangement of frond segments. The family Peranemataceae is generally not recognized in modern classifications (e.g. [16, 17, 39]). Our study shows that Peranemataceae sensu Ching , Wu [33, 34], and Wu & Ching  are not monophyletic because Nothoperanema, normally not viewed as a member of Peranemataceae, is embedded within Peranemataceae. In our analyses, Nothoperanema and Peranemataceae together formed a strongly supported monophyletic group in our analyses (ML BS: 98%; MP JK: 95%), sister to the Aemulae clade within Dryopteris (see below). Our molecular data unambiguously resolved the species of Peranemataceae as members of Dryopteris (Figure 1). The genus Acrophorus has been recognized by numerous authors (e.g., [16, 17, 33–35, 37–39, 41, 42]), but was not recognized by Fraser-Jenkins , who synonymized it with Peranema. Acrophorus is characterized by having a cordate and often persistent scale at the bases of costae, membranaceous and semi-globose indusia, a few multi-celled septate clavate paraphyses on the lower portion of the sporangiate stalk, and a few short multi-celled clavate appendages on the margins of scales at the stipe bases [33–35]. Acrophorus contains about 12 species occurring in Southeast Asia, westward reaching Papua New Guinea and Polynesia . Six species are sampled in our study including the type, A. nodosus C. Presl. Acrophorus is strongly supported as monophyletic in our study (Figure 1; ML BS: 100%; MP JK: 95%). In the ML tree it is sister to Diacalpe + Nothoperanema, but this resolution received low statistical support. In the ML BS tree, it formed an unresolved trichotomy with Diacalpe and Nothoperanema (tree not shown). Based on our study, Acrophorus belongs to Dryopteris, and represents a specialized group within Dryopteris with round indusia and cordate scales at costa base. Within Acrophorus, A. paleolatus Pic. Serm. is strongly supported as sister to the remaining species (Figure 1). Diacalpe is recognized by Pichi Sermolli , Wu [33, 34], Wu & Ching , and Christenhusz et al. , but is synonymized with Peranema by Nayar & Kaur  who also included Lithostegia Ching in Peranema. Lithostegia has a close affinity with Arachniodes as shown by Liu et al. and our unpublished data. Kuo , Kramer , and Smith et al. also treated Diacalpe as a synonym of Peranema. Four species, including the type, D. aspidioides Blume, are sampled in our study. Our analyses show that Diacalpe is strongly supported as monophyletic (ML BS: 89%; MP JK: 72%) and Diacalpe and Peranema are paraphyletic in relation to Acrophorus and Nothoperanema, contrasting Nayar & Kaur’s , Kramer’s , and Smith et al.’s  treatments of Diacalpe as a synonym of Peranema while recognizing Acrophorus. Our resolution of Diacalpe is consistent with Liu et al. where only two species of Diacalpe were sampled. Morphologically, Diacalpe is characterized by unstalked sori, a few single-celled long and clavate paraphyses on the lower portion of sporangiate stalk, and entire scales at the stipe bases [33–35]. Within Diacalpe, D. annamensis Tagawa is resolved as sister to the rest of species, with D. chinensis Ching & S. H. Wu then sister to D. aspidioides + D. christensenae Ching (Figure 1). With its two species occurring in tropical and subtropical Asia , the bitypic genus Peranema is recognized by nearly all pteridologists (e.g., [16, 17, 33–35, 37–39, 43, 46]). Peranema is strongly supported as monophyletic in our study (Figure 1; ML BS: 98%; MP JK: 94%). This genus is morphologically distinguishable from Diacalpe by having stalked sori, no paraphyses on the lower portion of sporangiate stalks, and a few short and single-celled clavate hairs on the margins of scales at the stipe bases [33–35]. Synonymization of Diacalpe with Peranema, as done by Nayar & Kaur , Kramer , Smith et al. , and Fraser-Jenkins , is rejected by our data, which resolved Peranema as sister to a clade containing Acrophorus Diacalpe, and Nothoperanema (Figure 1). Although the morphological difference between Dryopteris and Peranema is striking, e.g., the presence of stalked sori in the latter, our data show that Peranema, like other members of Peranemataceae, should be merged into Dryopteris. Originally described as a subgenus, Rumohra sect. Acrorumohra H. Itô , and later elevated to a genus , Acrorumohra is now widely recognized (e.g., [16, 17, 35, 38, 39, 47]), though Fraser-Jenkins  subsumed it under Dryopteris sect. Nephrocystis (H. Itô) Fraser-Jenk. Acrorumohra is well defined morphologically. Its pinnules are all anadromous and the terminal pinnules have asymmetrical bases, different from Dryopteris. Ten accessions of three species of Acrorumohra, including the type, A. diffracta (Baker) H. Itô, are sampled in our study. Our analyses demonstrate, for the first time, that Acrorumohra is paraphyletic in relation to Dryopteris polita Rosenst. D. polita is sister to A. hasseltii (Blume) Ching plus A. subreflexipinna (Ogata) H. Itô, and together these three are sister to A. diffracta. Our results clearly show that Acrorumorha is a member of Dryopteris. Recently, Acrorumohra subreflexipinna has been postulated to have arisen through recurrent hybridization between A. hasseltii and A. diffracta, with the former being its putative maternal parent and the latter its paternal progenitor . Our resolution of these three taxa (Figure 1: Acrorumohra clade) supports A. hasseltii as the maternal progenitor of A. subreflexipinna. Tagawa  originally described this taxon as a subgenus of Dryopteris. Ching  elevated it to a genus. Nothoperanema has been accepted at the generic level by many pteridologists (e.g., [35, 37, 38, 41, 47, 49]). In contrast, Itô , Copeland , and Ohwi  regarded it to be part of Ctenitis. Smith et al. and Christenhusz et al. treated it as part of Dryopteris based on Geiger & Ranker’s  findings. The most important morphological synapomorphy of Nothoperanema is the presence of short and thick setae on each side of the costae and at the forking position of the midribs . Eleven accessions of four species are included in our sampling, including the type of the genus, N. squamisetum (Hook.) Ching. For the first time, Nothoperanema is supported as monophyletic in our analyses (Figure 1; ML BS: 74%; MP JK: 57%), in contrast with Li & Lu’s  resolution where Nothoperanema was resolved as paraphyletic in relation to Acrophorus Diacalpe, and Peranema. Our study also confirmed Liu et al.’s  finding that Nothoperanema is embedded within a paraphyletic Peranemataceae. This resolution is accordant with the general morphological similarities except for differences in the morphology of the indusia between Nothoperanema and Diacalpe/Peranema. Our study also reinforced Geiger & Ranker’s [16; with N. rubiginosum A. R. Sm. & Palmer only sampled] finding that Nothoperanema is nested within a paraphyletic Dryopteris, and we conclude that Nothoperanema should be a member of Dryopteris. The two share similar reniform indusia, short rhizomes, and catadromic arrangement of frond segments. Within Nothoperanema, N. diacalpioides Ching, N. rubiginosum, and N. squamisetum together are strongly supported as sister to the remaining members of the genus. The relationship between N. hendersonii (Bedd.) Ching and N. shikokianum (Makino) Ching needs further clarifications. The genus Dryopsis was established by Holttum & Edwards  based on “Ctenitis subgen. Dryopsis Ching”. It is now widely recognized [17, 39, 53, 54], though the relationships among Ctenitis Dryopsis, and Dryopteris have been controversial. Morphologically, Dryopsis appears to be more distant from Ctenitis than from Dryopteris. Dryopsis has distinct venation on the abaxial surfaces, sori terminal on veinlets, and marginal, entire scales that are clathrate or not, but with long and dull areolae. Ctenitis has venation indistinct on both the adaxial and abaxial surfaces, sori middle on the veinlets, and scales ciliate on their margins, clathrate, and with nearly hexagonal and lustrous areolae [8, 13, 54]. The major difference between Dryopsis and Dryopteris is that the former has either shallow or deep rachis and costa grooves that are closed near their bases, as well as multi-celled hairs with a thickened base on the margins but not in the grooves of the rachis and costae. Dryopteris, in contrast, always has deep rachis and costa grooves that are connected near their bases, and normally has no hairs on the rachis or costae [8, 13, 54]. Dryopsis contains about 22 species  occurring in tropical and subtropical Asia and reaching southwestward to southern India and Sri Lanka, eastward to Japan and the Philippines, and southward to Malaysia and Indonesia. It is most diverse in the southern and southeastern Himalaya [13, 55]. With two species sampled, Liu et al. discovered that Dryopsis should be a member of Dryopteridaceae but Liu et al. failed to resolve the relationships among Dryopsis Dryopteris, and Peranemataceae sensu Ching [36, 37], and Wu . Liu et al. also concluded that Dryopsis is not closely related to Ctenitis. Six accessions of five species of Dryopsis, including the type, D. apiciflora (Wall. ex Mett.) Holttum & P. J. Edwards, are sampled in our analysis. Our results demonstrate that Dryopsis is monophyletic (ML BS: 76%; MP JK: 66%), in contrast to the resolution of Li & Lu , where three species of Dryopsis formed an unresolved trichotomy with two species of Dryopteris and one species of Acrorumohra. Our results also indicate that Dryopsis is nested within a paraphyletic Dryopteris (Figure 1), strongly suggesting that Dryopsis should be subsumed into Dryopteris. This resolution is not surprising given that the morphological difference between Dryopsis and Dryopteris is minute (see above). Within Dryopsis, the species sampled were resolved into two clades. Morphologically, species of the upper clade (D. apiciflora, D. clarkei (Baker) Holttum & P.J. Edwards, and D. sp.) have bullate scales, while those of the lower clade (D. heterolaena (C. Chr.) Holttum & P.J. Edwards, D. mariformis (Rosenst.) Holttum & P.J. Edwards) have flat scales (Figure 1). Our 100-species sampling is still not dense enough to rigorously test the monophylies of all supraspecific taxa (sections or subgenera) recognized in recent classifications by Fraser-Jenkins , Lu [2, 24, 25], and Wu & Lu , given that Dryopteris s.s. contains between 225  and 300 species , and in fact is even larger given that Dryopsis Nothoperanema, and Peranemataceae should be included in Dryopteris following our current work. However, our sampling allowed us to reject the monophylies of some supraspecific taxa because all four subgenera and 17 out of all 19 sections sampled (except D. sect. Purpurascentes and the monotypic D. sect. Politae) were represented by two or more species in our study (Appendix I). The non-monophyly of the 19 out of the 21 supraspecific taxa in Dryopteris strongly suggests that the current taxonomy of this genus is in need of revision. However, our data do not necessarily falsify the monophyly of these 19 sections. The disagreement between previous taxonomy and molecular results in Dryopteris may be due partly to interspecific hybridization and polyplodization [57, 58]. There are four well-documented allopolyploids in Dryopteris that have evolved via inter-clade hybridization, based on plastid trnL-F sequences, nuclear PgiC sequences, and/or biochemical evidence. D. guanchica, limited to Spain, Portugal, and the Canary Islands, has been postulated to be of hybrid origin between D. aemula (D. sect. Aemulae; our Aemulae clade) and possibly D. intermedia (D. sect. Lophodium) . The Japanese endemic D. shibipedis Sa. Kurata, an obvious member of D. sect. Variae judging from the morphology [1, 42], has possibly a hybrid origin between D. kinkiensis (D. sect. Erythrovariae; our Erythrovariae clade) and D. pacifica (Nakai) Tagawa (D. sect. Variae; our Variae clade) . Using allozyme data Jiménez et al. concluded that D. corleyi, an endemic of northern Spain, is of hybrid origin between D. aemula (D. sect. Aemulae) and D. oreades Fomin (D. sect. Dryopteris; not sampled in our study but would presumbly be in our Dryopteris clade). Our analyses based on plastid data and the resolution of D. corleyi as sister to D. aemula suggest that D. aemula is the maternal progenitor of D. corleyi. In addition, Sessa et al. found evidence of extensive hybridization among the New World species of Dryopteris that has involved inter-continental long-distance dispersal as well as inter-clade hybridization. These examples of hybridization not only highlight the importance of reticulate evolution and thus the importance of nuclear data in understanding the evolutionary history of Dryopteris, but also strongly support the inclusion of these 13 lineages, including the small segregates, within Dryopteris, as opposed to breaking Dryopteris into many small genera. Within the newly defined Dryopteris (incl. Acrorumohra, Dryopsis, Nothoperanema, and Peranemataceae; Figure 1), the 100 species included in the current study are resolved into the following 13 well-supported major clades based on our four-locus plastid data set (Figure 1). Most of these major clades are also defined by morphological synapomorphies. The Nothoperanema clade (ML BS: 98%; MP JK: 95%): This clade contains species of Peranemataceae sensu Ching , Wu [33, 34], and Wu & Ching  and Nothoperanema. The potential morphological synapomorphies of this clade include the presence of non-glandular hairs and round and inferior indusia. The genus Nothoperanema is defined by the presence of thick, stout, and reddish brown setae. The Aemulae clade (ML BS: 100%; MP JK: 100%): The Aemulae clade, or the Hawaiian glabra group , contains two species, Dryopteris aemula and D. corleyi, based on the current sampling. These two species are different enough morphologically to have been placed in different sections by Fraser-Jenkins . Our resolution of D. aemula is consistent with those of Geiger & Ranker , Juslén et al. , and Sessa et al. . This is not surprising because D. corleyi, an endemic of northern Spain, is thought to be of hybrid origin between D. aemula (D. sect. Aemulae) and D. oreades Fomin based on allozyme data (; see below). All three species of D. sect. Aemulae sensu Fraser-Jenkins  are included in our analysis, but they are resolved as polyphyletic, with D. chinensis and D. gymnophylla grouping with Acrorumohra and D. polita. Based on Geiger & Ranker , Juslén et al. , and Sessa et al. the Aemulae clade may also include D. guanchica Gibby & Jermy, D. glabra (Brackenr.) Kuntze, and D. hawaiiensis (Hillebrand) W. Robinson, but D. guanchica is an allotetraploid (see blow) and D. hawaiiensis possibly an allotriploid . The Acrorumohra clade (ML BS: 86%; MP JK: 81%): This clade contains species of Acrorumohra and Dryopteris chinensis, D. gymnophylla (D. sect. Aemulae), and D. polita (D. sect. Politae). The morphological synapomorphy is the flat scales in comparison with the Dryopsis clade, the Erythrovariae clade, and the Variae clade. The gain of bullate scales is considered here as the morphological synapomorphy of the expanded D. subgen. Erythrovariae including the Acrorumohra clade, the Dryopsis clade, the Erythrovariae clade, and the Variae clade. The Variae clade (ML BS: 95%; MP JK: 94%): The Variae clade contains species of Dryopteris sect. Variae Fraser-Jenk. It is characterized by having slightly bullate-based scales and stiffly coriaceous lamina and pinnules with caudate apices and pointed lobes [1, 26]. The Erythrovariae clade (ML BS: 99%; MP JK: 98%): This clade contains species of Dryopteris sect. Erythrovariae plus D. podophylla. It is characterized by having more bullate scales and herbaceous lamina and pinnules with acute apices and rounded lobes [1, 26]. The Dryopsis clade (ML BS: 76%; MP JK: 66%): This clade contains species of the former genus Dryopsis. The relatively moderate branch support may be the result of some missing sequence data for members of this clade. The potential major morphological synapomorphies are the rachis and costa grooves that are closed near their bases and the multi-cellular hairs (see above). The Cinnamomeae clade (ML BS: 100%; MP JK: 100%): The Cinnamomeae clade contains two species of Dryopteris sect. Cinnamomeae and one species of D. sect. Purpurascentes in our current sampling. This clade is defined by having pinnules angled acroscopically and usually with narrower bases and having linear scales on stipe base . The Crinales clade (ML BS: 100%; MP JK: 100%): This clade was named the Hawaiian exindusiate group by Palmer  and it contains five Hawaiian endemics, Dryopteris crinalis (Hook. & Arn.) C. Chr., D. mauiensis C. Chr., D. sandwiciensis (Hook. & Arn.) C. Chr., D. tetrapinnata W. H. Wagner & Hobdy, and D. unidentata (Hook. & Arn.) C. Chr. The potential morphological synapomorphy is the absence of indusia [18, 62]. The Pallidae clade (ML BS: 97%; MP JK: 99%): This clade contains some species of Dryopteris sect. Pallidae sensu Fraser-Jenkins , e.g., D. aitoniana Pic. Serm., D. odontoloma (Bedd.) C. Chr., D. pallida (Bory) C. Chr. ex Maire & Petitm., and D. mindshelkensis N. Pavl. (synonym: D. submontana (Fraser-Jenk. & Jermy) Fraser-Jenk. ), and additional species from other sections, e.g., D. goldiana (Hook.) A. Gray, D. monticola (Makino) (D. sect. Dryopteris), D. oligodonta (Desv.) Pic. Serm. (D. sect. Marginatae), and D. tokyoensis (Matsum. & Makino) C. Chr. (D. sect. Pandae), based our current sampling and Juslén et al. . The inclusion of D. odontoloma in this clade needs further study. This clade is weakly supported as sister to the Crinales clade (Figure 1; ML BS: <50%; MP JK: 50%). In comparison with its sister, the Pallidae clade has indusia, but the Pallidae clade can be defined by having narrowly deltate-lanceolate leaves and stalked pinnules . The Nephrocystis clade (ML BS: 100%; MP JK: 100%): This clade contains those species of Dryopteris sect. Nephrocystis sensu Fraser-Jenkins  with catadromous arrangement of leaf segments. It is characterized by having asymmetrical bases of basal pinnae with basiscopic pinnules much longer, and by having stipe-base scales that are lanceolate or ovate-lanceolate and brown . The Dryopteris clade (ML BS: 99%; MP JK: 100%): This clade contains large portion of species of Dryopteris subgen. Dryopteris sensu Fraser-Jenkins  and Wu & Lu  and is the most species-rich clade of the genus. Most species of this clade have symmetrical pinnule bases (exceptions include D. reflexosquamata D. rubrobrunnea, etc.) and are mainly distributed in the Sino-Japanese and Sino-Himalayan regions. The Lophodium clade (ML BS: 98%; MP JK: 100%): This clade contains species of Dryopteris sect. Lophodium Fraser-Jenk. and D. remota. The species of this clade share short-stalked pinnae, long-aristate ultimate segments, and minutely spinulose perispore sculpturing except D. remota. The Fragrantes clade (ML BS: 100%; MP JK: 100%): This clade contains one of the two species of Dryopteris sect. Fragrantes (H. Itô) Seriz., D. fragrans (L.) Schott. Our work shows that D. fragrans is outside of D. subgen. Dryopteris where it was placed by Fraser-Jenkins  and Wu & Lu , a resolution consistent with that in Geiger & Ranker . Most notably, our data agreed with Sessa et al. [27, 58] in resolving D. fragrans as sister to the rest of Dryopteris, though our statistical support values were low (ML BS: <50%; MP JK: 60%).Our data clearly show that the Dryopsis clade is sister to the Erythrovariae clade; these two together are sister to a clade containing the Acrorumohra clade and the Variae clade; these four clades together are sister to a clade containing the Aemulae clade and the Nothoperanema clade; and these six clades are strongly supported as monophyletic (ML BS: 99%; MP JK: 94%). The relationships among the remaining seven clades are resolved in the ML tree (Figure 1) but with weak (<50%) branch support. The genera, Acrophorus, Acrorumohra, Diacalpe, Dryopsis, Nothoperanema, and Peranema, should all be merged into Dryopteris. Most species of these genera share a short rhizome and catadromic arrangement of frond segments, unlike the sister genus of Dryopteris s.l., Arachniodes. The non-monophyly of the 19 out of the 21 supraspecific taxa in Dryopteris strongly suggests that the current taxonomy of this genus is in need of revision. However, our data do not necessarily falsify the monophyly of these 19 sections. The disagreement between previous taxonomy and molecular results in Dryopteris may be due partly to interspecific hybridization and polyplodization. The 13 well-supported clades identified with our data represent 13 major evolutionary lineages in Dryopteris that are supported by morphological synapomophies and may deserve circumscription as supraspecific entities within Dryopteris. All four subgenera and 14 out of 16 sections of Dryopteris recognized by Fraser-Jenkins  and three additional sections (D. sect. Caespitosae S. G. Lu, D. sect. Chrysocomae S. G. Lu, D. sect. Indusiatae S. G. Lu) recognized by Lu [2, 24, 25] and partly by Wu & Lu , were represented by two to 12 species each. The only sections sampled that were represented by one species are D. sect. Purpurascentes Fraser-Jenk. and the monotypic D. sect. Politae Fraser-Jenk. In total, 78 accessions representing 77 species of Dryopteris s.s. were sampled, including all four subgenera and 19 sections in the current classifications of Dryopteris s.s. by Fraser-Jenkins , Lu [2, 24, 25], and Wu & Lu . To assess the phylogenetic relationships between Dryopteris and Acrophorus, Acrorumohra, Diacalpe, Dryopsis, Nothoperanema, and Peranema, further included are eight accessions representing five (63%) out of eight species of Acrophorus, 10 accessions representing three (43%) out of seven species of Acrorumohra, seven accessions representing four (40%) out of 10 species of Diacalpe, six accessions representing five (31%) out of 16 species of Dryopsis, 11 accessions representing six (75%) out of eight species of Nothoperanema, and two accessions representing both species of the bitypic Peranema. Type species of all these six genera, Acrophorus, Acrorumohra, Diacalpe, Dryopsis, Nothoperanema, and Peranema, are included. In total, 122 accessions representing 100 species of the expanded Dryopteris (incl. Acrophorus, Acrorumohra, Diacalpe, Dryopsis, Nothoperanema, and Peranema) are included in this study. One species each of Arachniodes Blume, Leptorumohra H. Itô, and Lithostegia Ching of Dryopteridaceae are used as outgroups based on Liu et al. where Arachniodes Leptorumohra Lithostegia, and Phanerophlebiopsis Ching together were resolved as sister to a clade consisting of Acrophorus Acrorumohra Diacalpe Dryopsis Dryopteris Nothoperanema, and Peranema. All sequences used in this study together with their GenBank accession numbers and/or voucher information are listed in Appendix II. Total genomic DNA was extracted from silica-gel dried material or sometimes from herbarium specimens using Plant Genomic DNA Kits (TIANGEN BioTech., Beijing, China) and DNeasy Plant Mini Kits (Qiagen, Germany). The PCR protocols followed Zhang et al. and Ebihara et al. . DNA sequence data were obtained for four plastid regions, rbcL gene, rps4-trnS spacer, trnL intron, and trnL-F spacer. The rbcL gene was amplified with primers F1 (5’-ATGTCACCACAAACAGAAACTAAAGC; Fay et al. ) and 1379R (5’-TCACAAGCAGCAGCTAGTTCAGGACTC; originally designed by G. Zurawski and modified by Wolf et al. ). The primers for amplifying rps4-trnS intergenic spacer were derived from Souza-Chies et al. (5’-TACCGAGGGTTCGAATC; ) and Li & Lu (5’-ATGAATT(A/G)TTAGTTGTTGAG; ). The trnL intron and trnL-F intergenic spacer were amplified using the primers fern 1 (5’-GGCAGCCCCCARATTCAGGGRAACC; ) and the universal primer f (5’-ATTTGAACTGGTGACACGAG) of Taberlet et al. . Amplified fragments were purified with TIANquick Mini Purification Kits (TIANGEN) and ExoSAP-IT (USB, CA, USA). Purified PCR products were sequenced by InvitrogenTM (Shanghai, China) and BigDye® Terminator v3.1 Cycle Sequencing Kit (Applied Biosystems, CA, USA). Additional sequences were obtained from Genbank and had originally been generated by Geiger & Ranker , Li & Lu [19, 20], Ebihara et al. , de Groot et al. , Juslén et al. , and Sessa et al. [27, 58]. In total, 114, 92, 68, and 111 sequences of rbcL rps4-trnS trnL, and trnL-F, respectively, were included in our analyses. Some 151 DNA sequences are newly generated for this study (GenBank JX535813-JX535961). The alignment of the rbcL data was manually obtained using Microsoft Wordpad. Preliminary alignments of rps4-trnS and trnL-F (trnL intron + trnL-F spacer) data were obtained using the default alignment parameters in Clustal X  followed by manual adjustments. Gap characters were coded as missing data. Equally weighted maximum parsimony (MP) tree searches were conducted for each data matrix using 1000 tree-bisection-reconnection (TBR) searches in PAUP* ver. 4.0b10  with MAXTREES set to increase without limit. Parsimony jackknife (JK) analyses  were conducted using PAUP* with the removal probability set to approximately 37%, and “jac” resampling emulated. One thousand replicates were performed with 10 TBR searches per replicate and a maximum of 100 trees held per TBR search. In addition to the analyses of the four individual regions, MP and ML analyses of the combined trnL intron and trnL-F spacer were also conducted since these two linked regions are sometimes viewed as one locus. MrModeltest 2.3 , a modified version of Modeltest 3.6 , was used to select the best fit likelihood model for maximum likelihood (ML; ) analyses. The Akaike Information Criterion  was used to select among models instead of the hierarchical likelihood ratio test, following Pol  and Posada and Buckley . The models selected were GTR + G (trnL-F spacer), GTR + I (trnL intron), GTR + I + G (trnL intron & trnL-F spacer and the simultaneous analysis), HKY + G (rps4-trnS spacer), and SYM + I + G (rbcL gene). The selected models and parameters estimated (Table 2) were then used for tree searches from the respective data partitions. One hundred jackknife replicates were performed with one TBR search per replicate and a maximum of 100 trees held per TBR search. “G” = gamma distribution shape parameter . “GTR” = general-time-reversible model . “HKY” = Hasegawa-Kishino-Yano model . “I” = proportion of invariable sites. “SYM” = symmetrical model . “Ti/Tv” = transition/transversion ratio. The simultaneous ML analyses of nucleotide characters and ML bootstrapping (BS) were performed using RAxML-HPC2 on TG ver. 7.2.8 ([80, 81]; available at http://www.phylo.org/) with 1000 rapid bootstrap analyses followed by a search for the best-scoring tree in a single run. Our results show that none of the four subgenera, D. subgen. Dryopteris D. subgen. Erythrovariae D. subgen. Nephrocystis, and D. subgen. Pycnopteris (T. Moore) Ching, are monophyletic. Sessa et al. also rejected monophyly of these subgenera, except for D. subgen Pycnopteris, for which they had insufficient sampling to test monophyly. In the current study, most of the members of D. subgen. Dryopteris are resolved in the Dryopteris clade, while others are placed in other major clades except the Acrorumohra, Dryopsis, Erythrovariae, Nothoperanema, and Variae clades. Members of D. subgen. Erythrovariae sensu Fraser-Jenkins  are resolved in the Acrorumohra, Erythrovariae, and Variae clades, but these clades are paraphyletic in relation to the Dryopsis clade as well as D. chinensis (Baker) Koidz. and D. gymnophylla (Baker) C. Chr. (members of D. sect. Aemulae Fraser-Jenk. ), and D. podophylla (Hook.) Kuntze (a member of D. subgen. Pycnopteris). Members of D. subgen. Erythrovariae sensu Wu & Lu  are resolved in the Erythrovariae and Variae clades. The non-monophyly of D. subgen. Pycnopteris is consistent with Li & Lu’s [19, 20] finding based on rps4-trnS data. Of our three representatives of this subgenus, two fell in the Dryopteris clade (D. bodinieri (Christ) C. Chr. and D. sieboldii (Van Houtte ex Melt.) Kuntze), and one in the Erythrovariae clade (D. podophylla). Our sole sequence of D. podophylla was derived from Li & Lu . D. subgen. Nephrocystis is not monophyletic because Acrorumohra diffracta Baker (= D. diffracta (Baker) C. Chr. ), A. hasseltii Blume (=D. hasseltii (Blume) C. Chr. ), A. subreflexipinna (Ogata) Ching (= D. subreflexipinna Ogata), and D. futura A. R. Sm., a member of D. sect. Purpurascentes, are resolved in the Acrorumohra clade and the Cinnamomeae clade. Wu & Lu  did not recognize D. subgen. Nephrocystis. Dryopteris sect. Aemulae Fraser-Jenk. : Represented by D. aemula (Aiton) Kuntze (Aemulae clade), D. chinensis, and D. gymnophylla (Acrorumohra clade). Dryopteris sect. Caespitosae S. G. Lu: Represented by D. alpestris Tagawa (Dryopteris clade) and D. fragrans (Fragrantes clade). Dryopteris sect. Chrysocomae S. G. Lu: Represented by D. chrysocoma (Christ) C. Chr. and D. himachalensis Fraser-Jenk. (Dryopteris clade). Dryopteris sect. Dryopteris: This section sensu Fraser-Jenkins  is represented by D. alpestris D. filix-mas (L.) Schott, and D. sichotensis V. Komarov (Dryopteris clade). Dryopteris sect. Fibrillosae Ching: Represented by D. affinis (Lowe) Fraser-Jenk. subsp. borreri Fraser-Jenk., D. polylepis (Franchet & P. A. L. Saval.) C. Chr., and D. rosthornii (Diels) C. Chr. (Dryopteris clade). Dryopteris sect. Erythrovariae: This section sensu Fraser-Jenkins  is represented by D. caudipinna Nakai, D. championii (Benth.) C. Chr., D. cordipinna Ching & Shing, D. decipiens (Hook.) Kuntze, D. erythrosora (D. Eaton) Kuntze, D. gymnosora (Makino) C. Chr., D. indusiata Makino & Yamam. (= D. tenuicula C. Matthew & Christ following Fraser-Jenkins ), D. kinkiensis Koidz. ex Tagawa, D. nipponensis Koidz. (= D. cystolepidota (Miq.) Makino following Fraser-Jenkins ), D. ryo-itoana Kurata, and D. simasakii (H. Itô) Kurata and all are in the Erythrovariae clade. If D. podophylla (Hook.) Kuntze, a member of D. subgen. Pycnopteris, is included, this section sensu Fraser-Jenkins  becomes monophyletic. Dryopteris sect. Hirtipedes Fraser-Jenk. : Represented by D. atrata (Wall) Ching, D. commixta Tagawa, D. conjugata Ching, D. cycadina (Franchet & P. A. L. Savat.) C. Chr., D. dickinsii (Franchet & P. A. L. Savat.) C. Chr., D. handeliana C. Chr., D. hangchowensis Ching, D. lunanensis (Christ) C. Chr., D. scottii (Bedd.) Ching, D. stenolepis (Baker) C. Chr. and D. tsutsuiana Kurata, all of which are in the Dryopteris clade. This section becomes monophyletic if D. rosthornii (D. sect. Fibrillosae) and D. uniformis (D. sect. Pallidae) are included. Dryopteris sect. Indusiatae S. G. Lu: Represented by D. gymnosora (Makino) C. Chr. and D. indusiata Makino & Yamam. (Erythrovariae clade). Dryopteris sect. Lophodium (Newman) C. Chr. ex H. Itô: Represented by D. amurensis Christ, D. expansa (C. Presl) Fraser-Jenk. & Jermy, D. intermedia (Muhlenb. ex Willd.) A. Gray, and D. dilatata (Hoffm.) A. Gray (Lophodium clade). These four species are paraphyletic in relation to D. remota (A. Braun ex Doell) Druce, the type of D. sect. Remotae. The close relationship between D. remota and species of D. sect. Lophodium based on our plastid data shows that D. remota, a triploid, is possibly originated through hybridization with one of the species in D. sect. Lophodium being the maternal donor. Dryopteris sect. Marginatae Fraser-Jenk. : Represented by D. aquilinoides (Desv.) C. Chr. and D. shiroumensis Kurata & Nakaike (Dryopteris clade). They are resolved as paraphyletic in relation to the rest of the Dryopteris clade. Dryopteris sect. Nephrocystis: Represented by Acrorumohra diffracta A. hasseltii A. subreflexipinna Dryopteris hayatae Tagawa (subsumed in D. subexaltata (Christ) C. Chr. by Fraser-Jenkins ), D. melanocarpa Hayata (subsumed in D. platypus (Kunze) Kuntze by Fraser-Jenkins ), D. maximowicziana (Miq.) C. Chr. (not recognized by Fraser-Jenkins ), D. sabae (Franchet & P. A. L. Savat.) C. Chr., D. sparsa (Buch.-Ham. ex D. Don) Kuntze, and D. yakusilvicola Sa. Kurata (subsumed in D. cacaiana Tagawa by Fraser-Jenkins ). The first three species are resolved in the Acrorumohra clade while the rest are in the Nephrocystis clade. Dryopteris sect. Pallidae Fraser-Jenk. : Represented by D. juxtaposita Christ, D. lacera (Thunb.) Kuntze, D. sublacera Christ, D. uniformis (Makino) Makino (Dryopteris clade), D. odontoloma (Bedd.) C. Chr., and D. pallida (Bory) C. Chr. ex Maire & Petitm. (Pallidae clade). Dryopteris sect. Pandae Fraser-Jenk. : Represented by D. himachalensis Fraser-Jenk. (Acrorumohra clade) and D. tokyoensis (Matsum. & Makino) C. Chr. (Pallidae clade). Dryopteris sect. Remotae Fraser-Jenk. : Represented by D. corleyi Fraser-Jenk. (Aemulae clade) and D. remota (Lophodium clade). Dryopteris sect. Splendentes Fraser-Jenk. : Represented by D. reflexosquamata Hayata and D. rubrobrunnea W. M. Chu (Dryopteris clade). These two are paraphyletic in relation to three members of D. sect. Pallidae and two member of D. subgen. Pycnopteris. Acrophorus emeiensis Ching: rbcL zl1474, trnL JX535916, trnL-F JX535867, rps4-trnS JX535815. Acrophorus exstipellatus Ching & S. H. Wu: rbcL JX535857, trnL JX535914, trnL-F JX535865, rps4-trnS JX535813. Acrophorus macrocarpus Ching & S. H. Wu: rbcL DQ054522 (“Acrophorus emeiensis Ching”). Acrophorus nodosus C. Presl: rbcL AB575065, trnL JX535915, trnL-F JX535866, rps4-trnS JX535814. Acrophorus paleolatus Pic. Serm. (“Acrophorus stipellatus T. Moore”): rbcL DQ054510 DQ508756 EF463106, trnL-F DQ514500 EF540696 DQ480130. Acrorumohra diffracta (Baker) H. Itô: rbcL DQ508758 EF463108, trnL-F EU797681 EU797682 EU797683, rps4-trnS EU797685 EU797686 EU797687. Acrorumohra hasseltii (Blume) Ching: rbcL AB575136 DQ054519 DQ508757 EF463107, trnL-F DQ514479 EU797677 EU797679 EU797680, rps4-trnS DQ191888 EU797691 EU797692 EU797693. Acrorumohra subreflexipinna (Ogata) H. Itô: trnL -F EU797675 EU797676 EU797678, rps4-trnS EU797688 EU797689 EU797690. Arachniodes aristata (G. Forst.) Tindale: rbcL AY268851, trnL-F AY268782. Arachniodes assamica (Kuhn) Ohwi: rps4-trnS DQ191891. Diacalpe annamensis Tagawa: rbcL EF463125, trnL-F DQ480132 EF540698. Diacalpe aspidioides Blume: rbcL DQ054523 EF463126, trnL-F DQ514490. Diacalpe chinensis Ching & S. H. Wu: rbcL JX535864, trnL JX535956, trnL-F JX535908, rps4-trnS JX535854. Diacalpe christensenae Ching: rbcL DQ054518 EF540699, trnL-F DQ480131 EF540699, rps4-trnS DQ480131 EF540699. Dryopsis apiciflora (Wall. ex Mett.) Holttum & P.J. Edwards: rbcL DQ054521, trnL JX535957, trnL-F JX535909. Dryopsis clarkei (Baker) Holttum & P.J. Edwards: trnL JX535958, trnL-F JX535910, rps4-trnS JX535855. Dryopsis heterolaena (C. Chr.) Holttum & P.J. Edwards: rbcL DQ508770, trnL-F DQ514492. Dryopsis mariformis (Rosenst.) Holttum & P.J. Edwards: rbcL DQ054520 EF460683, trnL JX535959, trnL-F JX535911. Dryopsis sp. : rbcL DQ054525. Dryopteris aemula (Aiton) Kuntze: rbcL AY268881, trnL-F AY268816, rps4-trnS JN189189. Dryopteris affinis (Lowe) Fraser-Jenk. subsp. borreri Fraser-Jenk. : rbcL AY268849, trnL-F AY268776, rps4-trnS JN189190. Dryopteris alpestris Tagawa: rbcL JX535858, trnL JX535917, trnL-F JX535868, rps4-trnS JXH11103. Dryopteris amurensis Christ: rbcL AB575112, trnL JX535918, trnL-F JX535869, rps4-trnS JX535816. Dryopteris aquilinoides (Desv.) C. Chr. : rbcL AY268868, trnL-F AY268803, rps4-trnS JN189211. Dryopteris atrata (Wall) Ching: rbcL AB575115, trnL JX535919, trnL-F JX535870, rps4-trnS JX535817. Dryopteris bissetiana (Baker) C. Chr. : rbcL AY268862, trnL-F AY268796, rps4-trnS DQ191829. Dryopteris bodinieri (Christ) C. Chr. : rbcL DQ508772, trnL-F DQ514494, rps4-trnS DQ191830. Dryopteris caudipinna Nakai: rbcL AB575117, trnL JX535920, trnL-F JX535871, rps4-trnS JX535818. Dryopteris championii (Benth.) C. Chr. : rbcL AY268863, trnL-F AY268797, rps4-trnS DQ151856. Dryopteris chinensis (Baker) Koidz. : rbcL JX535859, trnL JX535921, trnL-F JX535872, rps4-trnS JX535819. Dryopteris chrysocoma (Christ) C. Chr. : rbcL DQ508773, trnL-F DQ514495, rps4-trnS DQ191832. Dryopteris cinnamomea (Cav.) C. Chr. : rbcL JN189528, trnL-F FR731991, rps4-trnS JN189202. Dryopteris commixta Tagawa: rbcL AB575120, trnL JX535922, trnL-F JX535873, rps4-trnS JX535820. Dryopteris corleyi Fraser-Jenk. : rbcL AY268873, trnL-F AY268808. Dryopteris crinalis (Hook. &Arn.) C. Chr. : AY268835, trnL-F AY268774. Dryopteris cycadina (Franchet & P. A. L. Savat.) C. Chr. : rbcL EF463127, trnL-F AY278400, rps4-trnS DQ191835. Dryopteris decipiens (Hook.) Kuntze var. decipiens: rbcL AB575123, trnL JX535923, trnL-F JX535874, rps4-trnS JX535821. Dryopteris dickinsii (Franchet & P. A. L. Savat.) C. Chr. : rbcL AB575125, trnL JX535924, trnL-F JX535875, rps4-trnS JX535822. Dryopteris dilatata (Hoffm.) A. Gray: rbcL AY268848, trnL-F AY268779, rps4-trnS JN189248. Dryopteris erythrosora (D. Eaton) Kuntze: rbcL DQ508774, trnL-F DQ514496, rps4-trnS JN189255. Dryopteris expansa (C. Presl) Fraser-Jenk. & Jermy: rbcL AY268844, trnL-F AY268775, rps4-trnS JN189180. Dryopteris filix-mas (L.) Schott: rbcL AY268845, trnL-F AY268776, rps4-trnS JN189181. Dryopteris fragrans (L.) Schott: rbcL AB575129, AY268865, trnL-F FR731981 AY268800, rps4-trnS JN189185. Dryopteris futura A. R. Sm. : rbcL JN189534, trnL-F JN189103, rps4-trnS JN189208. Dryopteris gymnophylla (Baker) C. Chr. : rbcL JX535860, trnL JX535925, trnL-F JX535876, rps4-trnS JX535823. Dryopteris gymnosora (Makino) C. Chr. : rbcL AB575132, trnL JX535926, trnL-F JX535877, rps4-trnS JX535824. Dryopteris hadanoi Kurata: rbcL AB575133, trnL JX535927, trnL-F JX535878, rps4-trnS JX535825. Dryopteris handeliana C. Chr. : rbcL AB575134, trnL JX535928, trnL-F JX535879, rps4-trnS JX535826. Dryopteris hangchowensis Ching: rbcL AB575135, trnL JX535929, trnL-F JX535880, rps4-trnS JX535827. Dryopteris hayatae Tagawa: rbcL AB575137, trnL JX535930, trnL-F JX535881, rps4-trnS JX535828. Dryopteris himachalensis Fraser-Jenk. : rps4-trnS DQ191845. Dryopteris indusiata Makino & Yamam. : rbcL AB575140, trnL JX535931, trnL-F JX535882, rps4-trnS JX535829. Dryopteris intermedia (Muhlenb. ex Willd.) A. Gray subsp. maderensis (J. Milde ex Alston) Fraser-Jenkins: rbcL AB575143, trnL-F FR731985. Dryopteris juxtaposita Christ: rbcL AY268875, trnL-F AY268810, rps4-trnS DQ191848. Dryopteris kinkiensis Koidz. ex Tagawa: rbcL AB575144, trnL JX535932, trnL-F JX535883, rps4-trnS JX535830. Dryopteris lacera (Thunb.) Kuntze: rbcL AB575148, trnL JX535933, trnL-F JX535884, rps4-trnS JX535831. Dryopteris laeta (Kom.) C. Chr. : rbcL AB575149, trnL JX535934, trnL-F JX535885, rps4-trnS JX535832. Dryopteris lunanensis (Christ) C. Chr. : rbcL AB575150, trnL JX535935, trnL-F JX535886, rps4-trnS JX535833. Dryopteris mauiensis C. Chr. : rbcL AY268833, trnL-F AY268770. Dryopteris maximowicziana: rbcL AB575151, trnL JX535936, trnL-F JX535887, rps4-trnS JX535834. Dryopteris melanocarpa Hayata: rbcL AB575153, trnL JX535937, trnL-F JX535888, rps4-trnS JX535835. Dryopteris monticola (Makino) C. Chr. : rbcL AB575154, trnL JX535938, trnL-F JX535889, rps4-trnS JX535836. Dryopteris nipponensis Koidz. :AB575156, trnL JX535939, trnL-F JX535890, rps4-trnS JX535837. Dryopteris odontoloma (Bedd.) C. Chr. : rbcL AY268872, trnL-F AY268807, rps4-trnS DQ191859. Dryopteris pacifica (Nakai) Tagawa: rbcL AB575157, trnL JX535940, trnL-F JX535891, rps4-trnS JX535838. Dryopteris pallida (Bory) C. Chr. ex Maire & Petitm. : rbcL AY268874, trnL-F AY268809, rps4-trnS JN189266. Dryopteris patula (Sw.) L. Underw. : rbcL JN189500, trnL-F AY268823, rps4-trnS JN189176. Dryopteris podophylla (Hook.) Kuntze: rps4-trnS DQ191864. Dryopteris polita Rosenst. : rbcL AB575158, trnL-F EU797684, rps4-trnS EU797694. Dryopteris polylepis (Franchet & P. A. L. Saval.) C. Chr. : rbcL AY268864, trnL-F AY268798, rps4-trnS JN189263. Dryopteris reflexosquamata Hayata: rbcL JN189604, trnL-F JN189171, rps4-trnS DQ191870. Dryopteris remota (A. Braun ex Doell) Druce: rbcL AY268858, trnL-F AY268792, rps4-trnS JN189204. Dryopteris rosthornii (Diels) C. Chr. : rbcL JX535861, trnL JX535941, trnL-F JX535892, rps4-trnS JX535839. Dryopteris rubrobrunnea W. M. Chu: rbcL JX535862, trnL JX535942, trnL-F JX535893, rps4-trnS JX535840. Dryopteris ryo-itoana Kurata: rbcL AB575161, trnL JX535943, trnL-F JX535894, rps4-trnS JX535841. Dryopteris sabae (Franchet & P. A. L. Savat.) C. Chr. : rbcL AB575162, trnL JX535944, trnL-F JX535895, rps4-trnS JX535842. Dryopteris sacrosancta Koidz. : rbcL AB575163, trnL JX535945, trnL-F JX535896, rps4-trnS JX535843. Dryopteris sandwiciensis (Hook. & Arn.) C. Chr. : rbcL AY268827, trnL-F AY268762. Dryopteris saxifraga H. Itô: rbcL AB575164, trnL JX535946, trnL-F JX535897, rps4-trnS JX535844. Dryopteris scottii (Bedd.) Ching: rbcL JX535863, trnL-F JX535898, rps4-trnS DQ191872. Dryopteris shiroumensis Kurata & Nakaike: rbcL AB575168, trnL JX535947, trnL-F JX535899, rps4-trnS JX535845. Dryopteris sichotensis V. Komarov: rbcL AY268869, trnL-F AY268804. Dryopteris sieboldii (Van Houtte ex Melt.) Kuntze: rbcL AB575169, trnL JX535948, trnL-F JX535900, rps4-trnS JX535846. Dryopteris simasakii (H. Itô) Kurata var. simasakii: rbcL AB575170, trnL JX535949, trnL-F JX535901, rps4-trnS JX535847. Dryopteris sordidipes Tagawa: rbcL AB575172, trnL JX535950, trnL-F JX535902, rps4-trnS JX535848. Dryopteris sparsa (Buch.-Ham. ex D. Don) Kuntze: rbcL AB575173, trnL JX535951, trnL-F JX535903, rps4-trnS JX535849. Dryopteris stenolepis (Baker) C. Chr. : rbcL AY268889, trnL-F AY268824, rps4-trnS DQ191877. Dryopteris sublacera Christ: rbcL DQ508778, trnL-F DQ514501, rps4-trnS DQ191878. Dryopteris tetrapinnata W. H. Wagner & Hobdy: rbcL AY268838, trnL-F AY268772. Dryopteris tokyoensis (Matsum. & Makino) C. Chr. : rbcL AY268861, trnL-F AY268795, rps4-trnS JN189251. Dryopteris tsutsuiana Kurata: rbcL AB575176, trnL JX535952, trnL-F JX535904, rps4-trnS JX535850. Dryopteris unidentata (Hook. & Arn.) C. Chr. var. unidentata: rbcL AY268825, trnL-F AY268766. Dryopteris uniformis (Makino) Makino: rbcL AB575177, trnL JX535953, trnL-F JX535905, rps4-trnS JX535851. Dryopteris varia (L.) Kuntze: rbcL AB575178, trnL JX535954, trnL-F JX535906, rps4-trnS JX535852. Dryopteris xanthomelas (Christ) C. Chr. : rbcL AY587118, trnL-F DQ150394, rps4-trnS DQ151857. Dryopteris yakusilvicola Sa. Kurata: rbcL AB575180, trnL JX535955, trnL-F JX535907, rps4-trnS JX535853. Leptorumohra quadripinnata (Hayata) H. Itô: rbcL DQ508781, trnL-F DQ514505, rps4-trnS EF540707. Lithostegia foeniculacea (Hook.) Ching: rbcL DQ508782, trnL-F DQ514506, rps4-trnS EF540717. Nothoperanema diacalpioides Ching: rbcL DQ054511. Nothoperanema hendersonii (Bedd.) Ching: rbcL AB575138 DQ508783 EF463135 JN189547, trnL-F DQ514507 JN189116, rps4-trnS DQ191885 JN189221. Nothoperanema rubiginosum (Brack.) A. R. Sm. & D. R. Palmer: rbcL AY268836 DQ054511 (“Nothoperanema hendersonii (Bedd.) Ching”) EF463182 (“Nothoperanema squamisetum (Hook.) Ching”), trnL-F AY268771. Nothoperanema shikokianum (Makino) Ching: rbcL AB575167 DQ054509 EF463136, trnL JX535960, trnL-F JX535912, rps4-trnS DQ191886 JX535856. Nothoperanema squamisetum (Hook.) Ching: rbcL DQ054512, trnL JX535961, trnL-F JX535913, rps4-trnS DQ191887. Peranema cyatheoides D. Don: rbcL DQ054513. Peranema luzonicum Copel. : rbcL DQ508784 (“Peranema cyatheoides D. Don”), trnL-F DQ514509 (“Peranema cyatheoides D. Don”). This project was partly supported by funding from the Open Laboratory of Ecological Restoration and Biodiversity Conservation of Chengdu Institute of Biology, Chinese Academy of Sciences, to LBZ. Special thanks go to Ning Wu for his support and to Kunihiko Uno for technical help. Chris R. Fraser-Jenkins and four anonymous reviewers kindly commented on the ms. Xiaohua Jin and Zhangming Zhu participated in part of field work. We thank the curators of the herbaria CDBI, IBSC, MO, and TNS for providing access to the material in their care. Hai He, Zhaorong He, Peishan Wang, Sugong Wu, and Weiming Zhu helped identify some specimens. LBZ desgined the study, conducted data analyses, and wrote the manuscript, LZ, EBS, and AE carried out the lab work, LZ, SYD, EBS, XFG, and AE collected and identified portion of the material. All authors contributed to the manuscript revision. All authors read and approved the final manuscript.